To analyze Earth's climate change on routine remote sensing, it is important to map both globally and locally essential climate variables such as leaf area index (LAI). LAI was first defined in 1947 as the total onesided area of photosynthetic tissue per unit ground surface area (Watson, 1947; Chen & Black, 1992). Testing LAI values on the ground campaigns gives us possibility to validate the actual quality of LAI maps produced from satellite observations. The aim of this study was to compile the leaf area index (LAI) map of a 3x3 km VALERI ground campaign test site in Järvselja Estonia, belonging to international VALERI (Validation of Land European Remote sensing Instruments, http://www.avignon.inra.fr/valeri/) project. Different detectors such as LAI-2000 Plant Canopy Analyzers, digital cameras supplied with fisheye converters, SPOT-4 HRV-IR and airborne lidar ALS50-II were used for this process. The resulting LAI maps were compared with standard LAI products from Terra MODIS and ENVISAT MERIS. Ground measurements of canopy gap fraction by the means of optically-based methods, such as LAI-2000 Plant Canopy Analyzers and digital cameras supplied with fisheye converters, were carried out according to VALERI protocol on 42 elementary sampling units in summer 2009, from July 28th to 31st. The vegetation LAI was estimated as a sum of the tree canopy true green LAI obtained from the inversion of canopy gap fraction data and of the ground vegetation effective LAI. Red channel from SPOT-4 HRV-IR image (August 8th, 2009) and airborne data (June 29th, 2010) based canopy transmittance were used for up-scaling. The LAI map (Fig. 7) was compared with standard LAI products from Terra MODIS and ENVISAT MERIS. We found that lidar data based LAI estimate on up-scaled map saturated at high values (LAI > 4.5) compared to the LAI estimates based on SPOT-4 HRV-IR red channel. Finally, up-scaled LAI maps were used to test consistency of global LAI products from Terra MODIS and ENVISAT MERIS systems. 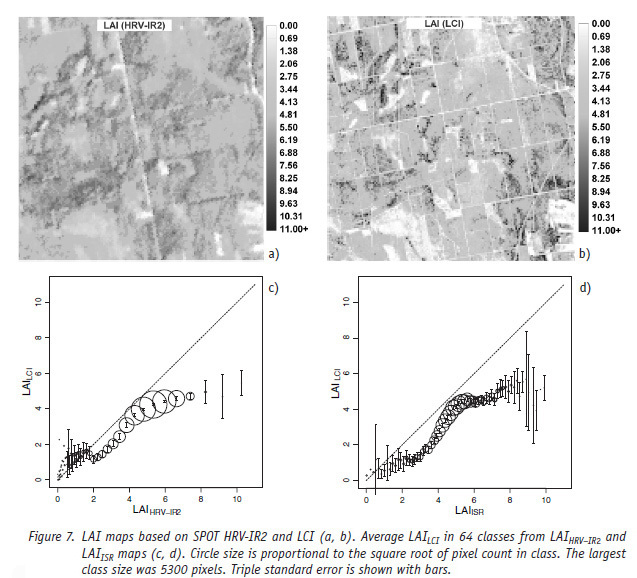 We found rather large non-natural variability when comparing subsequent MODIS LAI maps over test site (Fig. 8). LAI of mixed forests that are prevailing in MODIS land cover map over the test site was underestimated compared to the ground measurements (Table 2). Random noise was present also in the seasonal time series of MERIS LAI product (Fig. 9). 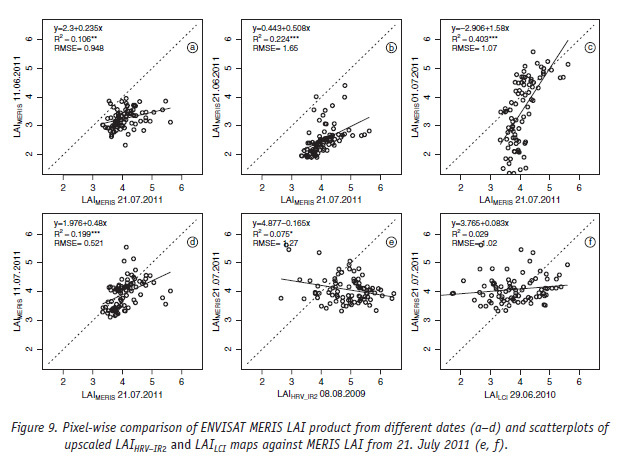 However, average MERIS LAI over test site was found to be more close to the up-scaled value (Table 2), despite the fact that MODIS LAI represents true green leaf area index and MERIS LAI is the effective green leaf area index. Chen, J.M., Black, T.A. 1992. Defining leaf-area index for non-flat leaves. - Plant, Cell & Environment, 15, 421-429. Kodar, A., Lang, M., Arumäe, T., Eenmäe, A., Pisek, J., Nilson, T. 2011. Leaf area index mapping with airborne lidar, satellite images and ground measurements in Järvselja VALERI test site. - Forestry Studies | Metsanduslikud Uurimused 55. Watson, D.J. 1947. Comparative physiological studies in the growth of field crops. I. Variation in net assimilation rate and leaf area between species and varieties, and within and between years. - Annals of Botany, 11, 41-76.